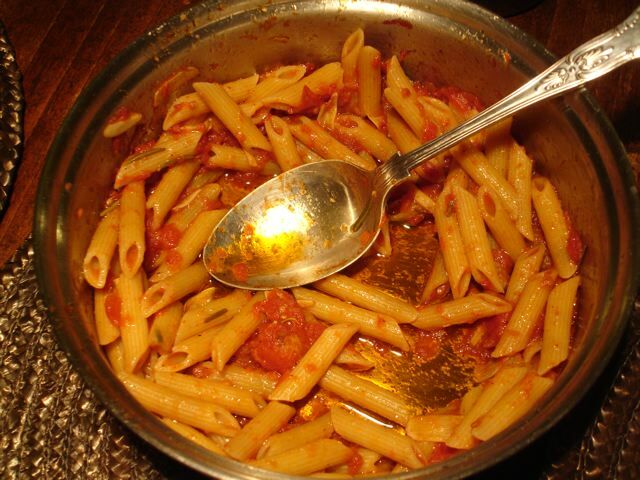 « Almond blossom to cheer me…..
Penne in a sauce of tomatoes, rosemary and balsamic vinegar. This is adapted from a recipe in Marcella’s Kitchen by Marcella Hazan. It is included in my recipe book Delicious Dishes for Diabetics (to be published in August this year in the UK, November in the USA). Quick and simple to do, it has a distinctive earthy flavour, thanks to the rosemary. It’s worth taking care to slice the garlic real thin. Sauté the garlic gently in the oil with the rosemary (if using fresh) until the garlic sizzles–a couple of minutes. Add the tomatoes, salt and plenty of pepper—(if using dried rosemary add it with tomatoes). Drain well and add to the sauce. Turn the pasta in the sauce and cook for a minute or two longer. Turn off heat and make a well in middle of the pasta and add the balsamic vinegar. Turn over the pasta again in the sauce. Serve on heated plates with freshly grated parmesan cheese. I love food and I really enjoy reading your blog. Thanks for sharing this post. Feel free to check out our recipes. do only use wholewheat, and I forgot to say that in the post. I shall change it now. Robin.